I'm keeping today's post short and sweet. Easter is staring at us through the windshield and we/you have to get to work. I love Sunday dinner. Throw in a holiday and you can count on Crabby to kick it into overdrive, (I refuse to say: "kick it up a notch"). That doesn't have to mean exotic ingredients cooked with flaming torches, it can mean just taking something simple and making it ludicrously complex and delicious. Heat 1 inch of water in a large skillet over low heat until bubbles form along the bottom of the pan, adjust heat to maintain the water at this temperature. In a large bowl combine the 6 ounces of chocolate along with the butter, liqueur and vanilla. Set the bowl in the water bath and stir until the chocolate has melted. In another bowl, whisk together the egg yolks, coffee and sugar. Set the bowl into the water bath and, whisking constantly, heat the mixture until it it thick and puffy, approximately 10 minutes. Remove from the water bath and whisk thoroughly into the melted chocolate. Allow to cool to room temperature. In yet another bowl, using a hand mixer, beat the egg whites until foamy. Add the cream of tartar and continue beating until soft peaks form. Gradually beat in the granulated sugar. Increase the speed to high and beat this mixture until the peaks become glossy and stiff. Using a rubber spatula, stir one quarter of the egg white mixture into the chocolate mixture. Once fully incorporated, gently fold in the remaining egg whites into the chocolate. In another bowl, using your hand mixer, beat the 1/2 cup of heavy whipping cream on medium high speed until soft peaks form. Gently, but thoroughly, fold the cream into the combined chocolate mixture, and transfer the mousse to (6) 6 - 8 ounce ramekins (or more). Use an ice cream scooper to get equal servings that mound beautifully in the ramekin. Refrigerate for at least 4 hours or up to 24 hours. 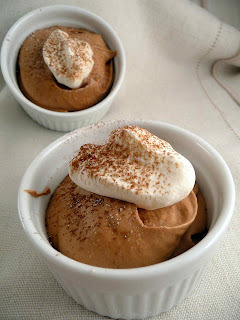 Serve with a dollop of whipped cream and a sprinkling of cocoa powder. Man! The one instruction I left out was: Hire someone to come in and wash all the bowls you've made a mess of because you're going to be too tired to clean them yourself. Of course, here at Crabby Central, the main mixing bowl with be cleaned by the collective snouts of King Crab and CrabCake2. Alrighty crablings, have a nice holiday dinner. This recipe wasn't really hard, just a lot of steps. Next time I promise something really easy. Until then, remember, you can do it, you can cook. 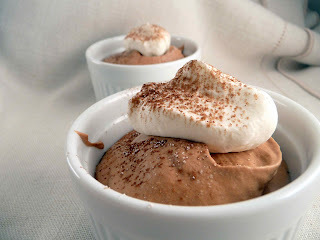 Oh my goodness--it looks just like the mousse my mom used to make! But better! Shh, don't tell mom. You're killin' me here Crabby. Another dish that is delicious, but not wine friendly. So, here is the Tuscan version for Easter dessert. Buy some almond biscotti, buy a bottle of Vin Santo. Serve them together and dunk the crunchy cookies in the Vin Santo. If my memory serves me and this is phoenetic spelling, Contucci is the Tuscan name for almond biscotti. My apologies to all for faulty memory if this is not even close. Vin Santo, wine of the Saints, is sweet and nutty, almost sherry-like in flavor but not really. I know that doesn't help, but it is one of the greatest Italian classic food-wine pairing. In the ingredient list, you have "1/4 granulated sugar" - 1/4 of what? cup? tablespoon? Good catch Matt that's 1/4 cup of granulated sugar. Thanks!